Free spring printables are some of my favorites to offer you as they are usually filled with flowers! The birth of spring flowers is one of life’s special moments to observe, don’t you agree? I’m working on designing some printables with my photography for you that will be available soon on the website, so look for those and subscribe so that you’ll be the first to know! Today I have TWENTY gorgeous (and I mean…GORGEOUS!) free printables for you to download and print. Some of the other things that you can do besides framing are printing for greeting cards, banners and table runners…similar to THIS POST. Above are just a few of the printables and there are more! Just tap below to see each one and download the ones that you would like! Thank you for sharing all these lovely Spring printable designs. It’s nice to remind all of us in the North, that spring will eventually come our way. We had another 3-4″ of snow fall over night, so it is hard for us to believe that Spring will ever arrive. Enjoy and please visit again soon! 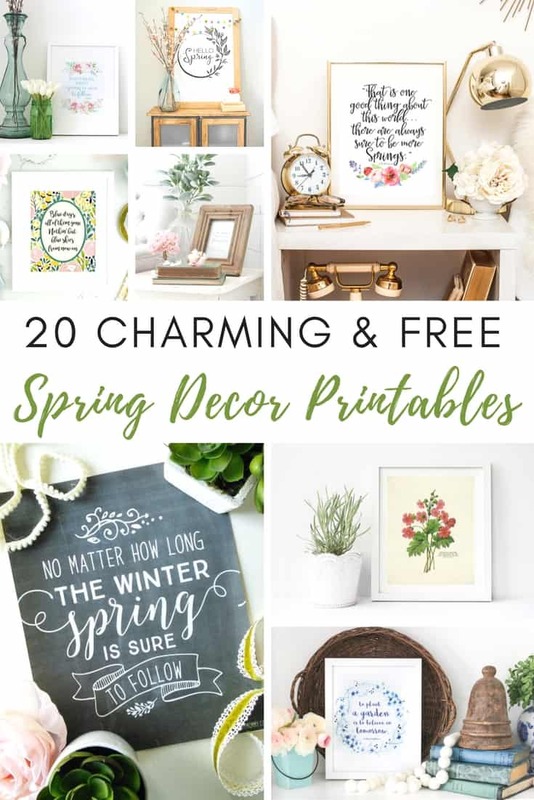 Thanks for sharing the spring printables. I chose the “Hello Spring”, but they are all beautiful! Hard choice Judy…they are all pretty indeed! Thanks for visiting and I hope that you enjoy! Thank you soo much for sharing those adorable prints! I will definitely use them for my spring decor.